In a last ditch effort to reorganize and refocus their efforts, Nokia will be laying off employees and outsourcing some efforts to consulting agencies. The BBC is reporting that Nokia has announced the loss of 4,000 worldwide jobs and the movement of over 3,000 employees to Accenture, a consulting group, who will be taking over the development of Symbian. In 2009, Accenture acquired the Symbian Professional Services Operation from Nokia in an effort to provide independent services to an open source ecosystem. With Nokia planning on manufacturing more than 150 million Symbian devices in the future, Accenture will be providing essential services to the continued growth and support of the platform. The recent news comes out of the decision for Nokia to adopt Windows Phone 7 as their main smartphone platform and ultimately bench MeeGo and Symbian for the long term future. Over 1,400 employees in Finland are expected to be let go, with the majority of them being MeeGo developers, Symbian architects and R&D researchers. Reductions in the UK are expected to be roughly 700 employees and it is said that Nokia will be saving upwards of 1.4 billion euros from recent restructuring by the year 2013. 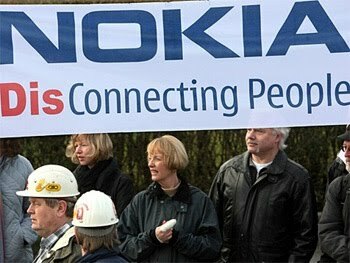 Nokia is said to be providing assistance to employees with offering long-term re-employment programs with partners for affected employees. Accenture will be taking up employees from China, Finland, India and the United States in an effort to provide positions for talented Symbian employees.